Right Away Rubbish Removals offers a convenient, reliable, and affordable option for picking up and removing household rubbish and other unwanted items. Excess waste can take up valuable space inside and outside of your home. However, ridding your home of old junk can de-clutter your storage areas, garage or yard and create a healthier environment for you and your family. Whether you have old TV’s, computers, fridges, old stained carpets that need removing, the old couch, dining tables or desks, washing machines, dryers, rubbish builders have left from the home renovation or extension, through to old paint tins, bikes…what ever needs throwing away in your house we can do it. 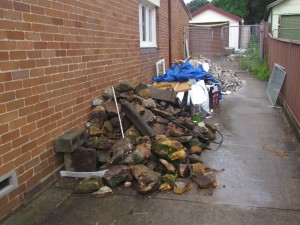 No one is better equipped to do this than the super friendly and very strong team at Right Away Rubbish Removals. We have trucks always on the road servicing the entire Sydney region and we can be at your home in no time (ask about our fantastic same day service rates) getting rid of those unwanted household rubbish items. So don’t delay and think that the rubbish will miraculously disappear please give Dean a call on 0418 444 093 for the very best pricing on your household rubbish, waster, white goods and furniture removals. 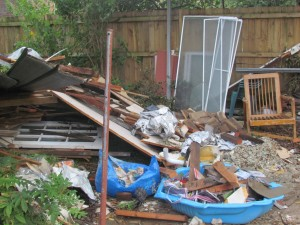 Right Away Rubbish Removals can remove garden waste, household rubbish, white goods and any other unwanted items. No matter what you need removed, you can trust in our ability to move waste in the most efficient and environmentally friendly way. Right Away Rubbish Removals can remove garden rubbish and any other unwanted items from your home in a fast and affordable manner. Our services also extend to cleaning out deceased estates throughout Sydney. We promise to be thorough in our cleaning and respectful of the deceased’s possessions and property. We know that this can be a difficult time so we are very prompt, reliable and above all super clean. When we say we will be there at a certain time, we make sure we are.